Nothing like dropping a non-league game against a top-10 opponent right in the heat of the conference race to keep a softball team on its toes. That’s the situation the College of San Mateo softball team found itself in on Thursday. With only one Coast Conference game scheduled this week, CSM head coach Nicole Borg used the scheduled down time to have the Bulldogs make up a rained-out game against San Joaquin Delta College, ranked No. 6 in Northern California. CSM, however, showed just how much of a disparity there is between the Mustangs and the No. 1 team in the state as the Bulldogs cruised to an 8-2 victory. Delta (21-12) put the pressure on CSM starting pitcher Emily McAdams early. 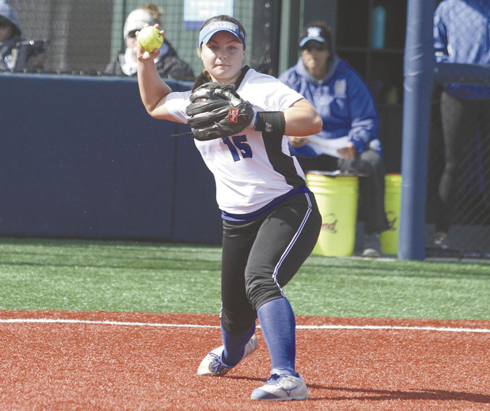 She walked two of the first three batters she faced and, if not for a stabbing catch of a line drive by CSM first baseman Lexi Riccardi that she turned into an unassisted double play, the Bulldogs might have been playing from a deficit. But the double play, followed by a groundout to end the inning kept the game scoreless. McAdams would go to pitch a complete game, giving up two runs on five hits and striking out four. With the pitching and defense in sync, the offense for CSM (31-4) showed it can hurt teams in different ways. The Bulldogs manufactured their first three runs before they turned to the long ball later. Leadoff hitter Allie Stines continues to be one of the best hitters in the state as she went 3 for 4 with a home run and four RBIs. “Stines is just a great hitter,” Borg said. Lauren Quirke had a pair of hits, drove in a run and scored, while Gaby Zucchiatti homered and scored twice. “McAdams did a good job, but mostly our sticks won this one,” Borg said. Delta starting pitcher Marissa Espinoza seemed to struggle with the zone in the first inning as well but, unlike the Mustangs, the Bulldogs capitalized by scratching out a run. With Quirke on second after reaching on fielder’s choice, catcher and cleanup hitter Mackenzie Driscoll flipped a run-scoring single into right field to drive in Quirke with the first run of the game. Espinoza rebounded to retire the Bulldogs in order on three pitches in the second inning, but CSM touched her for two more runs in the third for a 3-0 lead. Quirke’s single up the middle drove in Hailey Hiett, who had singled to lead off the inning. Lexi Riccardi drove in the second run, legging out a swinging bunt for an infield hit on the play and plating Zucchiatti, who had reached on an error. Delta finally got to McAdams in the fourth inning on a bloop double to shallow right field and an infield hit that featured a scary collision at the first-base bag, but both the runner and CSM first baseman Riccardi stayed in the game. CSM got the runs right back in the bottom of the frame as the Bulldogs turned to the long ball for their offense. With two outs and Emily Cotla on second via a single and passed ball, Stines came to the plate and, after working a 3-1 count, blasted an Espinoza offering off the netting in front of the scoreboard in right-center field for a two-run homer and a 5-1 advantage. It was 6-1 one pitch later as Zucchiatti jumped on the first pitch she saw and hit it to nearly the same spot as Stines. Zucchiatti’s shot wasn’t nearly as high, however, and the ball hit on the very top of the wall and bounced over for the solo home run. CSM tacked on two more runs in the fifth, with Stines, once again, providing the big hit. With the two outs and the bases loaded, Stines took a pitch back through the middle to drive in both Ally Sarabia and Cotla. And after facing one of the top teams in Northern California, they Bulldogs will take on one of the best teams in the state when they host a Bakersfield team ranked No. 3 in the state. After that, there are only four games left in the regular season before CSM embarks on what they hope is a sixth straight trip to the state final four. But it’s one step at a time. This entry was posted on Monday, April 16th, 2018 and is filed under Athletics, Softball. You can follow any responses to this entry through RSS 2.0. You can leave a response, or trackback from your own site.